Thursday January 1st 1920 I wrote a letter to Hattie and mailed it on the way over to Duncans where I went to dinner and spent the day with other company. Martie went home this morning. It was a bright cold day. I walked home between sun-down and dark Thinking of Will all the way. Vene not very well. The girls busy with the work. Friday January 2nd 1920 There was a cold wind today and I did not attempt to go out. I did quite a lot on crotchet work. A letter from Rob, Joe Woolf and Alice Condon. Vene better. The girls busy. Saturday January 3rd, 1920 I was at home all day. I worked on the bed-spread what time I had. A letter from Hattie and Cousin Jen saying it would be convenient for me to visit them. Sophia Woolf here in the afternoon. Sunday January 4th, 1920. It was cold today but the folks company came from near Armington. The Alexanders and Darnells. 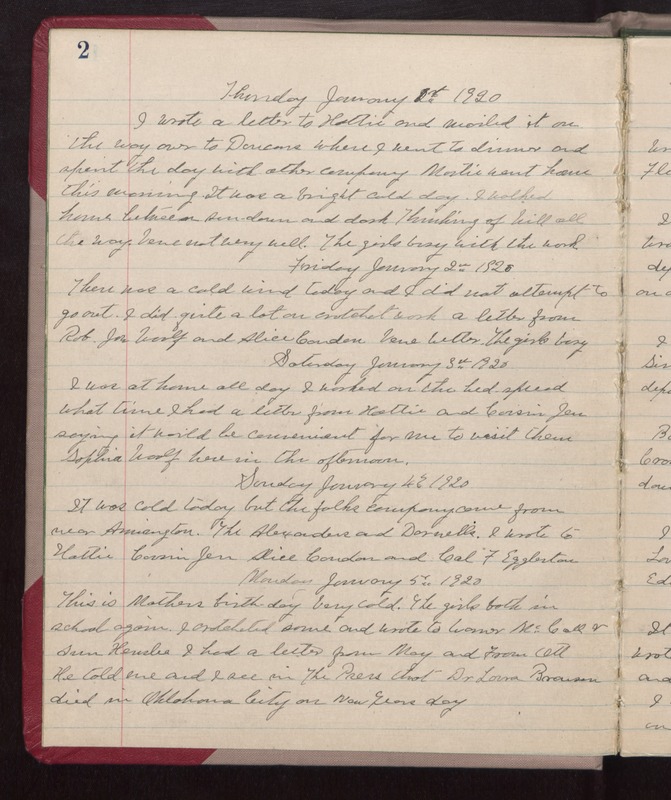 I wrote to Hattie, Cousin Jen, Alice Condon and Cal F Eggleston Monday January 5th, 1920. This is Mothers birth-day Very cold. The girls both in school again. I crotcheted some and wrote to Warner McCall & [Sam?] Hensler I had a letter from May and from Ott. He told me and I see in The Press that Dr Lorna Bronson died in Oklahoma City on New Years day.